THERE'S A BIG PAYBACK AT THE END OF THIS LINE. “It’s all about the people” at the Pinball Asylum. 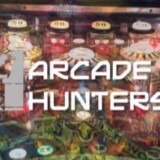 Also, check out this blog by Eric Rodriguez of Pinball Aficionando. Also, also… ALGAR?! Yes, really. ALGAR! ALGAR is one of those games that is always broken when I step up to play it. Sort of like Road Kings which I’ve only played once, ever at Pinfest. OK, back to the Asylum.